Anyone could only describe the 1988 season as successful both from a team point of view and individual achievements. Colin Pratt was happy to see the team collect the KO Cup for keeps (for winning it three times in succession), finishing in third place in the league winning the Premiership and then rounding off the season by beating Wolves in the Dudley Wolves Trophy. Cradley's British League Division 2 team also won the KO Cup beating Reading in the Final creating a unique double. 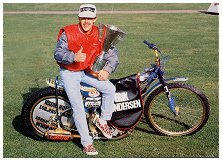 On bike: - Erik Gundersen. The season started badly for the Heathens though, losing four of the first five matches. Alan Grahame still suffering from a serious illness and Gert Handberg visibly lacking in experience only found their true form later in the season, indeed Alan was a great influence on the team especially when the Heathens went to Belle Vue for the Cup Semi-Final second leg without Erik. Only the determination of Alan and Erik got the Heathens through. Colin Pratt had high praise for Jan O and Erik, "What can you say about a rider who wins 95 per cent of his races from the back? He creates brilliant racing not only at Dudley Wood but everywhere he goes, and as for Erik he has won an astounding 16 gold medals in 10 seasons. OK, Ivan Mauger picked up 15 but how long was he riding? He is so professional, a great number one and a good ambassador for the sport." Individually Erik was World Champion again with Jan.O finishing third, both riders were part of Denmark's successful World Cup Team. Erik won a hat-trick of gold medals in the World Pairs, he was also runner up in the British League Riders Championship behind Jan.O! Simon Cross too was runner up in the World pairs (with Kelvin Tatum) and also winner of the Overseas Final but was bitterly disapointed to go out in the Intercontinental Final at Vetlanda. Simon set the pace in the Golden Hammer equalling the track record (61.5) in heat one but Hans Nielsen went on to to take the coveted trophy. Erik had a testimonial metting at Dudley Wood on the 8th June. The race of champions was won by Bruce Penhall who narrowly defeated Ole Olsen, Erik and Bernie Persson. Bruce Cribb showed his skills on an ice bike setting a new track record of 56.7 seconds, but it was Crossie who won the main event in a six lap final winning a new Tolba / GM speedway bike. Cradley hosted an International Test Match in September - England 48 Denmark 60. 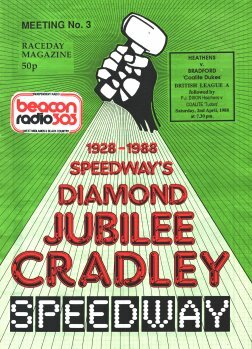 Although Cradley lost the first leg of the Premiership against Coventry the Bees were unable to find a suitable date for the return leg and the Trophy was awarded to the Heathens. Again Erik Gundersen won the World Final, this time on his home soil - Vojens, Denmark. In an all Danish rostrum with Hans Nielsen runner-up and Cradley's Jan O.Pedersen in third place. Erik completed a trio of World Championships again, with the World Pairs this time partnered with Hans Nielsen and the World Team Cup.